ArmorGarage color chips are the highest quality chips you can buy. They have vibrant colors that will standout in your epoxy coating and won't disintegrate during handling and application like other chips do. If you desire a terrazzo or granite look to your indoor epoxy floor then order these chips. Simply enter the total number of pounds you want in the Qty Box. there is a 10lb minimum. In The Chip Color Box enter the color and number of pounds you want for each color chip. Please note we can only process whole number of pounds. We recommend 10lbs for every 500 square feet for terrazzo look and 20lbs for every 500 square feet for granite look. Example; 3lbs of blue, 2 lbs of white and 1 lb of black is acceptable, 3.5 pounds of blue is not acceptable. FOR FULL SIZE COLOR CHART CLICK HERE. Please allow a minute for this large file to open. Also please note that due to EPA restrictions only the Green Glow In The Dark chips are available. These will charge out at an additional $50.00/lb. Please specify the Qty of the glow in the dark chips you want in the comment box. When using color flakes it's imperative that you protect them with a clear topcoat. We offer two versions, a standard heavy duty topcoat with no odor and a military grade topcoat that has a strong odor until it dries. Whenever possible we recommend the military grade topcoat, it's a much harder/durable finish. When working in occupied spaces or inside a home the standard topcoat should be chosen. We also strongly recommend the use of the nonslip additive, all epoxy finishes are slippery when wet. You can select the topcoat of your choice from the drop down menu on the Coat-All Indoor Kit product page. Apply the chips to the wet epoxy of each batch that you apply. Sprinkle in chips a little at a time so as not to end up with blotches or piles of chips. Leave a wet edge of epoxy without any chips so you can feather in the next batch of epoxy and then cover with chips. Chip coverage should be a medium to medium heavy coverage. 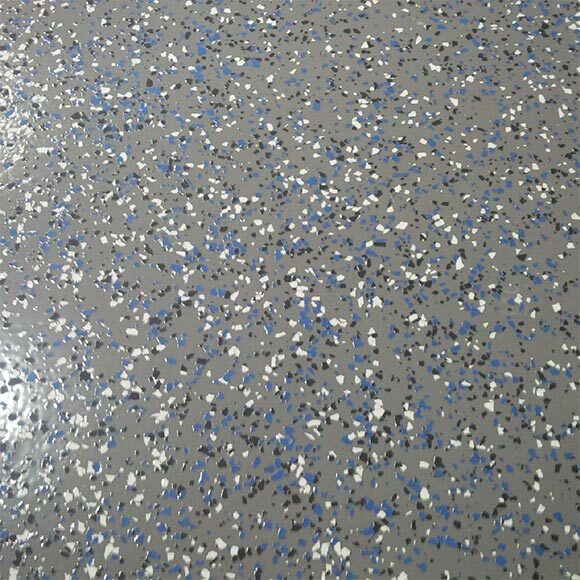 We strongly recommend that you use spike soles while applying the color flakes, it allows you to walk in the wet epoxy so that you can easily disperse the flakes. This eliminates the risk of have piles or blotches of flakes if you simply toss the flakes from the perimeter of the wet epoxy. The method below involving a shaker jug is used while wearing spike soles. 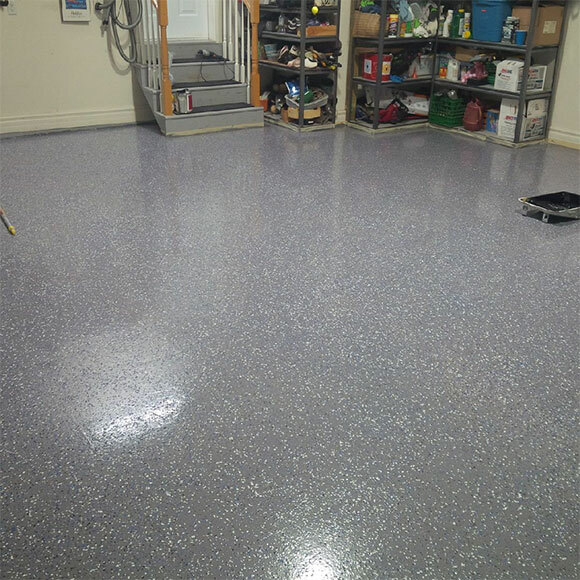 AS YOU CAN SEE THIS METHOD RESULTED IN A BEAUTIFUL EPOXY FLOOR CHIP PATTERN THAT IS AS GOOD AS IT GETS. Always use a clear topcoat and nonslip additive over your color flakes for protection. See the drop down menu on the Indoor Coat-All Epoxy Kit product page.